UPDATE: May 29, 2018 – This post includes a small amount of sample code illustrating a pattern for lazily generating assets using AWS Lambda and Amazon S3. If you’re looking to deploy a service to resize images to production, consider using the Serverless Image Handler which is a robust solution to handle image manipulation and can be deployed via an AWS CloudFormation template. With the explosion of device types used to access the Internet with different capabilities, screen sizes, and resolutions, developers must often provide images in an array of sizes to ensure a great user experience. This can become complex to manage and drive up costs. Images stored using Amazon S3 are often processed into multiple sizes to fit within the design constraints of a website or mobile application. It’s a common approach to use S3 event notifications and AWS Lambda for eager processing of images when a new object is created in a bucket. In this post, I explore a different approach and outline a method of lazily generating images, in which a resized asset is only created if a user requests that specific size. When you redesign your website or application, you can add new dimensions on the fly, rather than working to reprocess the entire archive of images that you have stored. Running a batch process to resize all original images into new, resized dimensions can be time-consuming, costly, and error-prone. With the on-the-fly approach, a developer can instead specify a new set of dimensions and lazily generate new assets as customers use the new website or application. With eager image processing, the resized images must be stored indefinitely as the operation only happens one time. The approach of resizing on-demand means that developers do not need to store images that are not accessed by users. As a user request initiates resizing, this also unlocks options for optimizing storage costs for resized image assets, such as S3 lifecycle rules to expire older images that can be tuned to an application’s specific access patterns. If a user attempts to access a resized image that has been removed by a lifecycle rule, the API resizes it on demand to fulfill the request. “Design for failure and nothing will fail.” When building distributed services, developers should be pessimistic and assume that failures will occur. If image processing is designed to occur only one time upon object creation, an intermittent failure in that process―or any data loss to the processed images―could cause continual failures to future users. When resizing images on-demand, each request initiates processing if a resized image is not found, meaning that future requests could recover from a previous failure automatically. A user requests a resized asset from an S3 bucket through its static website hosting endpoint. The bucket has a routing rule configured to redirect to the resize API any request for an object that cannot be found. Because the resized asset does not exist in the bucket, the request is temporarily redirected to the resize API method. The user’s browser follows the redirect and requests the resize operation via API Gateway. 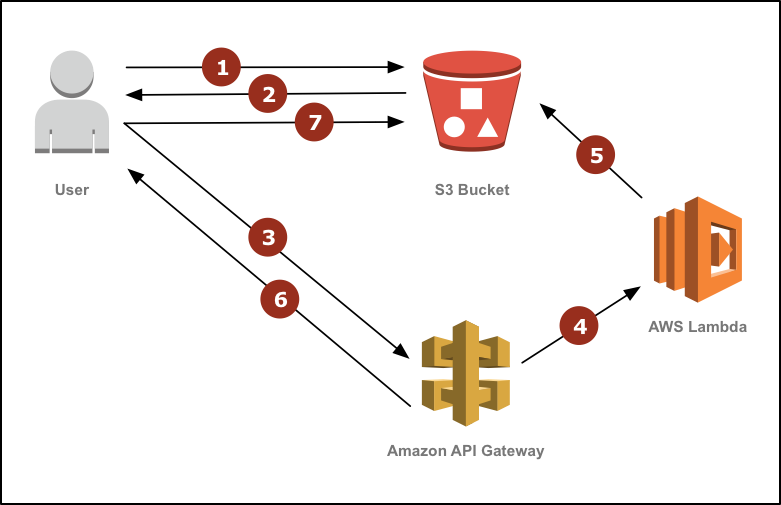 The API Gateway method is configured to trigger a Lambda function to serve the request. The Lambda function downloads the original image from the S3 bucket, resizes it, and uploads the resized image back into the bucket as the originally requested key. When the Lambda function completes, API Gateway permanently redirects the user to the file stored in S3. The user’s browser requests the now-available resized image from the S3 bucket. Subsequent requests from this and other users will be served directly from S3 and bypass the resize operation. If the resized image is deleted in the future, the above process repeats and the resized image is re-created and replaced into the S3 bucket. A working example with code is open source and available in the serverless-image-resizing GitHub repo. You can create the required resources by following the README directions, which use an AWS Serverless Application Model (AWS SAM) template, or manually following the directions below. In the S3 console, create a new S3 bucket. Choose Permissions, Add Bucket Policy. Add a bucket policy to allow anonymous access. Choose Static Website Hosting, Enable website hosting and, for Index Document, enter index.html. Note the name of the bucket that you’ve created and the hostname in the Endpoint field. In the Lambda console, choose Create a Lambda function, Blank Function. To select an integration, choose the dotted square and choose API Gateway. To allow all users to invoke the API method, for Security, choose Open and then Next. For Name, enter resize. For Code entry type, choose Upload a .ZIP file. Choose Function package and upload the .ZIP file of the contents of the Lambda function. For Key, enter BUCKET; for Value,enter the bucket name that you created above. For Key, enter URL; for Value, enter the endpoint field that you noted above, prefixed with http://. To define the execution role permissions for the function, for Role, choose Create a custom role. Choose View Policy Document, Edit, Ok. Replace YOUR_BUCKET_NAME_HERE with the name of the bucket that you’ve created and copy the following code into the policy document. Note that any leading spaces in your policy may cause a validation error. For Memory, choose 1536. For Timeout, enter 10 sec. Choose Next, Create function. Choose Triggers, and note the hostname in the URL of your function. In the S3 console, open the bucket that you created above. Expand Static Website Hosting, Edit Redirection Rules. You should see a smaller version of the test photo. If not, choose Monitoring in your Lambda function and check CloudWatch Logs for troubleshooting. You can also refer to the serverless-image-resizing GitHub repo for a working example that you can deploy to your account. The solution I’ve outlined is a simplified example of how to implement this functionality. For example, in a real-world implementation, there would likely be a list of permitted sizes to prevent a requestor from filling your bucket with randomly sized images. Further cost optimizations could be employed, such as using S3 lifecycle rules on a bucket dedicated to resized images to expire resized images after a given amount of time. This approach allows you to lazily generate resized images while taking advantage of serverless architecture. This means you have no operating systems to manage, secure, or patch; no servers to right-size, monitor, or scale; no risk of over-spending by over-provisioning; and no risk of delivering a poor user experience due to poor performance by under-provisioning. If you have any questions, feedback, or suggestions about this approach, please let us know in the comments!